I'm pretty much a fan of anything Lori Wick has ever written and this is no exception. I love this series. Slater and Liberty are a fun couple. I love the innocence of these romances. There is a restrained passion between the couple that shows honor towards each other and towards God. Slater is a new Christian and has recently left his job as a Ranger to find a more permanent home where he can grow in his newfound faith. Liberty is her sheriff brothers backup whenever he needs her. The couple has a rocky start when Liberty has to arrest Slater for not relinquishing his gun and Slater refuses to pay the $10 fine to get out of jail. Once Slater repents of his stubbornness and pride he pays up and seeks employment in town. It isn't sitting right with him that Liberty has to put herself in danger to protect her brother. Liberty too has some pride issues in that she believes that she is the only one that can protect her brother. Even though they are attracted to each other will they both be able to yield their pride and let God do His job? 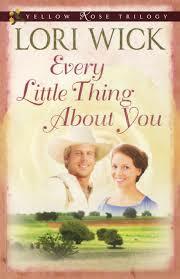 Every Little Thing About You is the first book in this 3 book series. I have read them before and I'm definitely a fan of the Rawlings brothers! Next up: A Texas Sky where we read about Dakota Rawlings.